Nikki Haley, the United States’ Permanent Representative to the United Nations, has announced the US will withdraw from the UN Human Rights Council. Effective leadership requires leading by example, but Australia’s human rights record has drawn increasing criticism at home and abroad. Sunday is Human Rights Day. December 10 marks 69 years since the United Nations General Assembly adopted the Universal Declaration of Human Rights on December 10, 1948. With the 70th anniversary coming up in 2018, the UN has launched Stand Up 4 Human Rights, a year-long campaign to bring the ideals of the declaration closer to reality. As a leader in the framing of the UN declaration and one of the world’s oldest democracies, Australia prides itself on its commitment to democracy and human rights. The Australian government has an excellent opportunity to show leadership in promoting these values at home and abroad when it takes up a seat on the UN Human Rights Council from 2018. 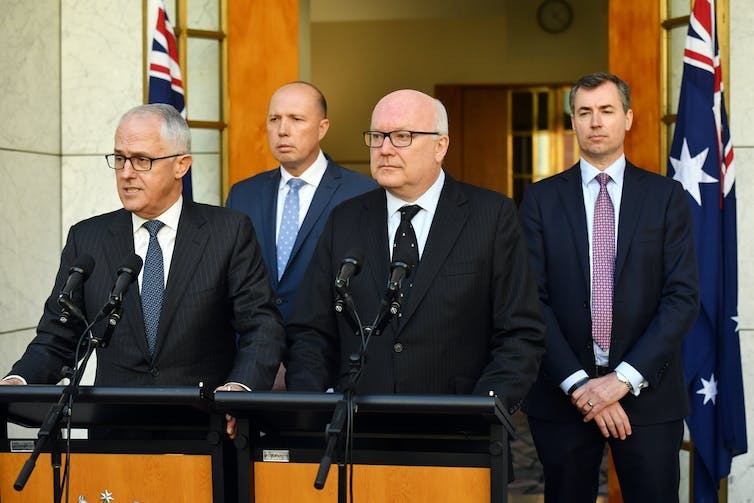 In this role, Australia has pledged to be “an international human rights leader” and to advance human rights with “active, practical advocacy, sensitivity and fairness, and a willingness to speak out against human rights violations and abuses”. However, effective leadership requires leading by example, and Australia’s human rights record has drawn increasing criticism in recent years. What can we do to strengthen our human rights framework? We recently brought together Australian human rights scholars to answer this question. Our collection of articles in the Australian Journal of Human Rights, entitled Vanguard or laggard? Democracy and human rights in Australia, details the relationship between democracy and human rights, and provides a roadmap for improving Australia’s democratic and human rights record. diagonal accountability denotes the role of free speech, media and civil society organisations in holding governments to account. There is no clear-cut nexus between Australian democracy and human rights across these areas of accountability. And the conditions necessary for each form of accountability to operate successfully are not as strong as is generally assumed. Accountability mechanisms are often overshadowed by parliamentary supremacy in our version of Westminster democracy. This leaves many citizens vulnerable to rights infringements. A core weakness in Australia’s vertical accountability is the lack of an entrenched or statutory bill of rights. This leaves the executive and legislature with primary control over human rights determinations. Voters decide who these legislators are and can change them at elections if they are unhappy with their decisions on rights issues. History suggests voters have indeed punished governments that fail to act on majority rights concerns. However, protection for minority rights, and the rights of Indigenous Australians and refugees in particular, do not attract sufficient support at the ballot box. Not surprisingly, government policies reflect this electoral reality. Without a bill of rights, minorities and others whose rights are threatened also have limited capacity to trigger horizontal accountability mechanisms for protection. Aside from some exceptional rulings, such as the High Court’s implied rights determinations, Australian judges have generally been reluctant to read the law broadly to incorporate rights. Further, the Australian Human Rights Commission has a limited mandate. It is also vulnerable to funding cuts and political attacks when government perceives the commission to have overstepped its mark. These deficiencies have become more obvious in recent years with the rise of the “security state”. Diagonal accountability mechanisms, including a free press and civil society, have been able to flourish in Australia. Even so, there are major limitations to their ability to pursue rights concerns. We have seen increasing media concentration, funding cuts to public broadcasters and the extension of legislative restrictions on civil society. Such developments reduce the potential for these democratic actors to bring problems to light and inform governments and voters about rights issues. Unless or until Australians decide to support greater rights protections, whether through constitutional or legislative action, these problems are likely to remain. Fixing these problems is important. This is not only because human rights are important in themselves, but also because democracy requires a basic level of respect for human rights to function properly. With Australia becoming a member of the UN Human Rights Council, it is more important than ever that we get our own house in order, if we want to be a model for good democratic practice underpinned by a strong human rights framework. Having secured a seat at the UN Human Rights Council, Australia needs to get its own house in order. Here’s a start: these ten broad steps are eminently doable. While not covering all the gaps, these will get us a long way toward more robust human rights protection in Australia. A bill of rights will increase the capacity of minorities and others whose rights are threatened to seek protection from the courts, if and when parliament fails to do so. Reverse funding cuts to public media outlets. Achieve a better balance between security laws and freedom of speech by adding public interest disclosure protections to national security laws. Strengthen the independence of integrity institutions such as statutory officeholders (information commissioners, human rights commissioners). This includes mandating transparent, arm’s length and merit-based selection criteria for appointments to these offices. Stronger statutory guarantees of adequate funding are also needed. Strengthen our compulsory voting laws because of their beneficial (yet generally unrecognised) effects on human rights protection, particularly their demonstrated capacity to protect rights such as equality before the law, freedom from discrimination and equal voting power. Continue to support electoral commissions in their efforts to achieve universal or near-universal electoral participation. Support the flourishing of civil society organisations by removing restrictive protest laws. Ensure a fair and nonpartisan regulatory framework for funding civil society organisations. Dismantle the intellectual and legal framework that creates barriers to recognising and respecting Indigenous Australians. Be open to Indigenous perspectives and realities and make a genuine effort to right historical wrongs. Strengthen racial discrimination laws to prevent the abuse of the special measures provisions of the Racial Discrimination Act to the detriment of Indigenous Australians. Australia must not forget that seeking asylum is a human right. Uphold human right obligations that are owed to asylum seekers on the presumption that they may well be genuine refugees (as the 1951 Convention on Refugees that Australia has signed requires). This includes closing all offshore processing and detention centres. Promote the human rights of all migrants and their families as Australia’s representatives have promised at UN meetings such as the Global Compact for Refugees and Migrants. Improve women’s social and economic rights to enable them to participate fully and equally in Australian society. This includes closing the gender pay gap, increasing access to affordable child care and tackling the poverty facing disadvantaged women including single mothers, Indigenous women, older women, women and girls with disabilities, and women facing domestic violence and sexual harassment in the workplace and community. Implement a policy framework to better uphold our international commitments to protect the economic and social rights of vulnerable Australians. This includes acting on housing affordability and homelessness, protecting vulnerable workers, reducing unemployment and underemployment, and increasing support for the poorest households. Honour the outcome of the Marriage Law Postal Survey by legalising marriage equality. Happy Human Rights Day everyone.